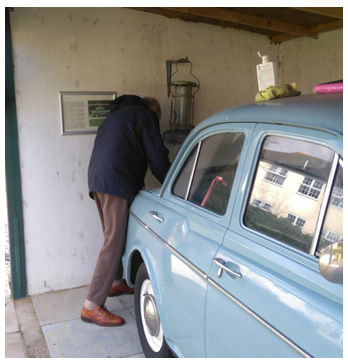 Euan does not only enjoy polishing his shoes, no, he enjoys even more polishing the car! 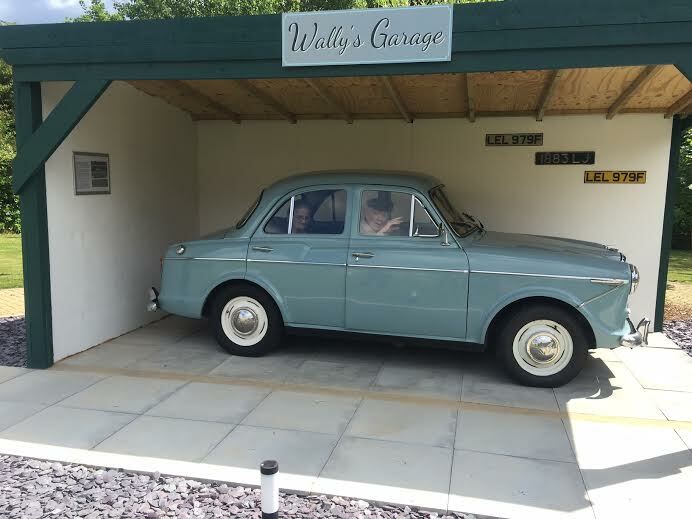 After he washed the Woolsley in and out by hand, he polished the lovely automobile until it sparkled like new. Thank you, Euan, we all appreciate your effort. Solent Dolphin Boat Trips on the M/V Alison MacGregor. 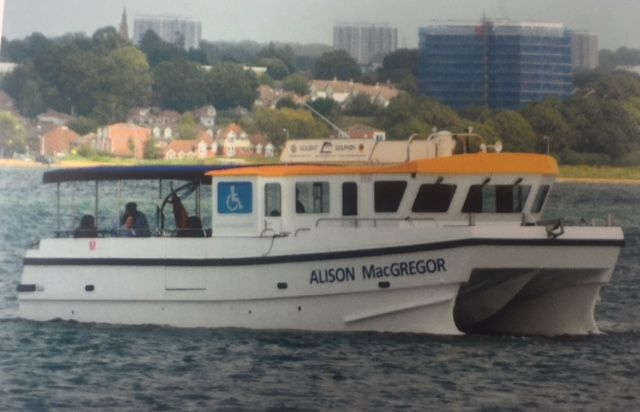 Solent Dolphin was conceived in 1987 by New Forest Rotary Club for the purpose of taking people with disabilities on day trips out to sea. It is a Registered Charity and operates a purpose built 11 metre motor catamaran. The trips are free of charge. The boat has ramp access and is therefore also designed for passengers in wheelchairs or those with walking difficulties. All trips leave from Hythe Marina towards Southampton Harbour. There we’ll have the chance to see all the impressive cruise liners and get all the information we want. All passengers get tea, coffee or hot chocolate served with lovely biscuits. And if it is a bit chilly blankets are offered to everyone. We booked one trip last summer, which was a great success for our residents who could join. For two of them it was the last chance to be on sea before they sadly passed away. This year we were lucky to book 4 trips between June and September. And everybody is looking forward to take part. 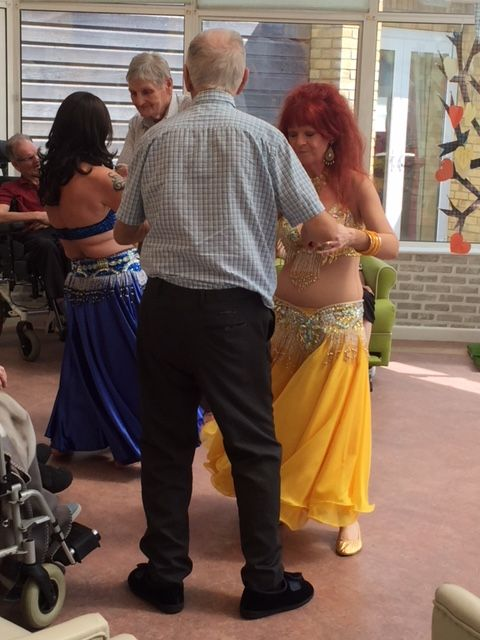 Our Residents enjoyed an afternoon being taken into the fairy tales of Thousand and one Nights. Some of our Gentlemen were invited to dance with the Flowers of the Desert and they certainly loved it. The Oriental music, the colourful costumes and the dancers brightened up the day for everyone. A big Thank you to Habibi from all at Birchy Hill for this nice afternoon entertainment. A big day for our English Residents as they were very proud to celebrate St George’s Day on Monday, 23rd April. The English flag was waving to us from the garden, the lounges were decorated with English roses, and the kitchen spoiled us with a wonderfully themed High Tea in the afternoon. 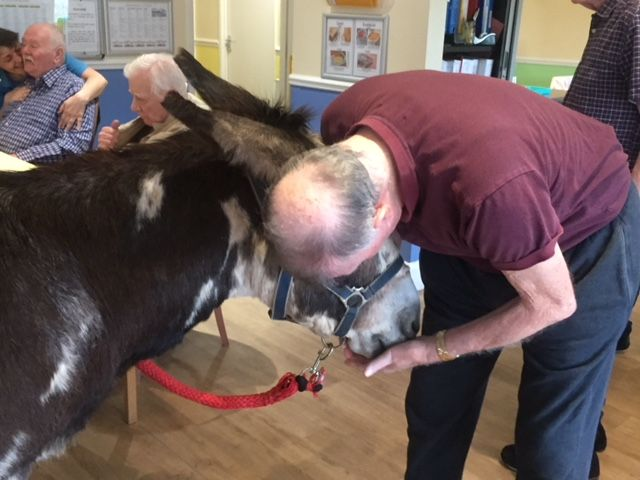 As part of our animal therapy sessions we invited Pedro the Donkey and his handler Ron from the Animal Sanctuary Mike’s Donkeys. The Residents loved Pedro. He was kissed and hugged and was even offered to sleep in one gentlemen’s bed. Everyone laughed when they saw how many ‘Rolos’ a Donkey can eat on his way through a Care Home. To our surprise the Donkey was able to walk up and downstairs without a problem and could therefore visit all our 5 different units easily. We hope to see Pedro again soon and send him a grateful ‘hee-haw’.